Spider GADUBIDI was listed as a missing person when he wandered off from the Bidyadanga Community, LaGrange, WA on the 4th of April 2008. He is believed to suffer from dementia, is hearing impaired, and can become disoriented. Spider was last seen wearing a blue long sleeve shirt and long white pants, bare feet. Despite extensive inquiries by Police and family, his whereabouts is not known. Concerns are held for his welfare. If you know the whereabouts of Spider GADUBIDI, call Crime Stoppers on 1800 333 000. 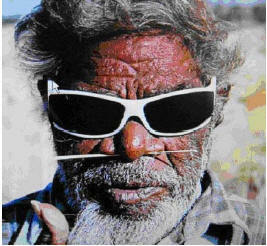 WA Police are seeking information from the public to help locate an 82 year old man who was last seen setting off for walk from the Bidyadanga community in the Kimberley on the morning of 8 April 2008. Spider GADUBIDI often takes a morning walk around the community and is usually away from home for around two to three hours. On this occasion, however, Mr GADUBIDI failed to return and did not have any food or water with him. Despite extensive searches conducted by police, volunteers and community members on foot, by vehicle and by air, Mr GADUBIDI has not been found. It is still unknown whether Mr GADUBIDI is living in the bush, has become disoriented and is unable to find his way back home, or has travelled elsewhere for cultural reasons. He is described as being of Aboriginal appearance, approximately 153cm tall, of medium build, with dark greying short hair and a goatee beard. He was last seen wearing a light blue long sleeved shirt and white pants, and had bare feet. He has dementia, a hearing impediment and is currently taking medication. Anyone with further information is asked to contact Crime Stoppers on 1800 333 000 or Bidyadanga Police on 08 9192 4091.